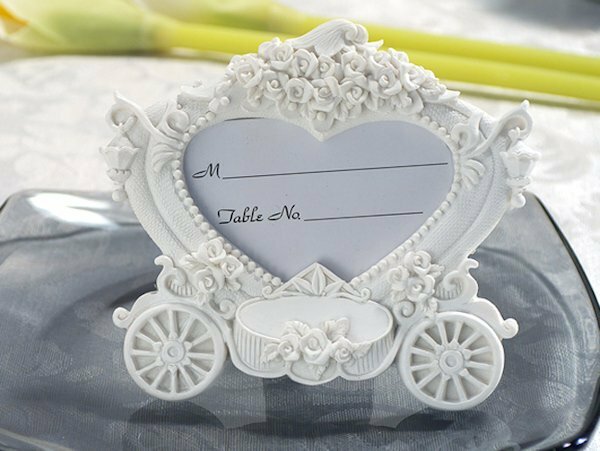 These adorably designed place card/photo frames are a great way to share your fairytale come true with your guests. The unique styles of the white resin wedding coach frames are complete with floral details and shimmering glitter. The place card or photo is framed with a heart shape and the bottom of the favor features two carriage wheels. The favor measures 3" x 2.5" and holds approximately a 2" x 2" photo or place card. They arrive individually in their own white gift box.